Ready to ride the streets of Los Angeles on your two-wheeler without the fear of being mowed down by a motorist? 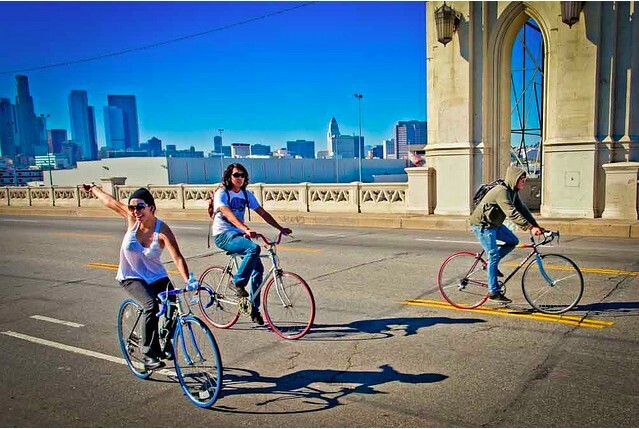 The second CicLAvia event date has been set for Sunday, April 10th, 2011, when 7.5 miles of city streets will be set aside for cyclists to move from East Hollywood to Koreatown to MacArthur Park to Downtown to Little Tokyo to Boyle Heights. CicLAvia says the route will likely be the same as that of the inaugural 10-10-10 event, and they&apos;re also already looking to make good on their promise to do multiple events next year. Right now they&apos;re working to select Sunday dates in both July/August and September/October. Those events may even include extensions to the route "with additional new spurs into South L.A., Boyle Heights, and/or Chinatown, depending on how quickly we can work with these communities to get the new route spurs ready."